For details, refer to the Product Warranty Registration Card provided. Tabata USA, Inc. and Tabata Corp. Ltd. / 2002 Design. Tabata Corp. Ltd. All rights are reserved. Data Sensing and Processing Device (U.S. Patent no. 4,882,678), Ascent Rate Indicator (U.S. Patent no. 5,156,055). fulfill the required EU directives. Navy (or other) No Decompression Tables, is no guarantee of avoiding decompression sickness, i.e. your body will react to a particular dive profile. for up to 7 years, before the unit is initially placed in service. Pacific Time will be displayed and it will be ready to operate with full functions. ON displaying the MAIN TIME screen, then release them. it can only be placed back in it by the factory. Welcome to TUSA and thank you for choosing the ZEN ! completely before attempting to use the ZEN as a dive computer. provides the person using it with data, not the knowledge to use it. Throughout this manual they will be referred to as the M, S, L, and A buttons. ON in the default WATCH MAIN TIME (home time) mode (Fig. 1), like a standard WATCH, until the Mode is changed. Default Time display and access dive computer modes. regardless of what operating mode it is in. GAUG Mode only allows access to Fly, Log, and History Modes. FREE Mode only allows access to specific Free Modes. releasing the S button (less than 2 seconds). or entry into another type of warning situation. which cannot be acknowledged or set Off. The Audible will not be active if the Alarm is Set OFF (a group A setting). Situations that will activate the NORM/GAUG 10 second Alarm include • Descent deeper than the Max Depth Set Point selected. • Dive Time Remaining at the Set Point selected. • Elapsed Dive Time at the Set Point selected. • High PO2 of 1.60 ATA or the Set Point selected. • High O2 of 300 OTU (single or daily exposure). • Nitrogen Bar Graph at the segment Set Point selected. M), or 30 FPM (9 MPM) at 60 FT (18 M) and shallower. • Entry into Decompression Mode (Deco). • Conditional Violation (above a required Deco Stop Depth for less than 5 minutes). • Delayed Violation (above a required Deco Stop Depth for more than 5 minutes). • Delayed Violation (a Deco Stop Depth greater than 60 FT/18 M is required). • Delayed Violation (Maximum Operating Depth of 330 FT/100 M is exceeded). • A Gas Switch would expose the diver to PO2 greater than 1.60 ATA. 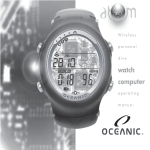 • Watch Daily Alarm reaches time set (disabled during Dive Modes). • Watch Mode Countdown Timer reaches 0:00. A single short beep (which cannot be disabled) is emitted for the following • Upon completion of a battery change. • Change from Delayed to Full Violation 5 minutes after the dive. 60 FT (18 M), or 26 to 30 FPM (7.5 to 9 MPM) at 60 FT (18 M) and shallower. 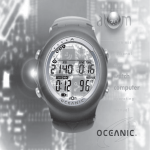 • FREE Dive Elapsed Dive Time Alarm (3 beeps every 30 seconds if set On). • FREE Dive Depth Alarms 1/2/3 (set sequentially deeper) - each 3 beeps 3 times. • FREE Dive NiBG Alarm (Caution zone, 4 segments) - 3 beeps 3 times. • Entry into Deco during a FREE Dive (Permanent Violation) - 3 beeps 3 times. • Free Dive Mode Countdown Timer reaches 0:00 - each 3 beeps 3 times. minutes (referred to as a Delayed Violation). • Decompression requires a Ceiling Stop Depth of 70 FT/21 M or deeper. To activate the Backlight - press the L (lower/right) button. the user set Duration time of 0, 5, or 10 seconds, for a maximum of 20 seconds. • Press the button again to activate as desired. the ZEN is connected to a PC. dive hours if 2 dives are conducted during each dive period. The ZEN checks battery voltage every 2 minutes on the surface. changed prior to commencing a series of dives. operation for the remainder of that dive. was sampled during dives and stored in the ZEN's memory. or until completion of the Upload or Download operation. location and is normally selected as the Local Default Time. while visiting the travel location. become the Local Default Time until changed. > Nitrogen Bar Graph, if any after NORM/FREE dives. > O2 Bar Graph, if any after NORM Nitrox dives. WET (if the unit is wet). > Time of Day (hr:min:sec) with AM (or PM) icon if 12 Hour Format, no icon if 24 Hour. > Battery icon, if a Low Battery Condition exists. will step through the Main Watch Modes. will access NORM/GAUG Log and History Modes. screen (Elev, Temp, Date) for 5 seconds. will silence and acknowledge the Daily Alarm. • Pressing the L button will activate the Backlight. seconds will access the SET TIME Menu. > Date (Month.Day or Day.Month). revert to the Watch Default Time screen. > Day of the Week is set automatically when the Date is set. bypassing those that don't require setting. a period of 2 minutes, operation will revert to the Watch Default Time screen. Point M - D or D - M flashing (Fig. 10). > M - D means Month will be displayed to the left of Day. > D - M means Day will be displayed to the left of Month. will toggle between M - D and D - M.
screen with the Set Point flashing. clock icon and the Set Point 12 or 24 flashing (Fig. 11). will toggle between 12 and 24.
will save the Set Point and access the Set Time screen. increments at a rate of 8 per second. Set Points one at a time. will save the Hour Set Point and the Minute digits will flash. will step upward through the Year Set Points one at a time. and the Month digits will flash, regardless of their location on the display. will step upward through the Month Set Points one at a time. Point and the Day digits will flash, regardless of their location on the display. will step upward through the Day Set Points one at a time. and revert to the Watch Default Time screen. > Year will not be displayed in any mode other than Set Date. Time screen is displayed will access the Watch Alternate Time screen. > Day of the Week graphic MON (or TUE, WED, THU, FRI, SAT, SUN). > Clock icon, if the Daily Alarm is set On. > Time of Day (hr:min:sec) with AM (or PM) icon. > Graphic ALt, indicating Time as Alternate (remote). access the Watch CDT (Countdown Timer). will access Set ALT Time . > Graphics SEt and ALt. increments of 1 Hour at a rate of 8 per second. operation will revert to the Watch Default Time screen. time it will default to OFF and the value previously set. will Start the Timer if a Time has been set. seconds will access Set Watch CDT. Set Points in 1 hour increments at a rate of 8 per second. will toggle from OFF to ON and Start the Timer. increments of .01 (1/100th sec). displayed when Laps are frozen and when later recalled. presses of the S button will then have no effect. will display other Laps/Times (Fig. 19). • Depressing the M button for 2 seconds will revert to the Watch Default Time screen. 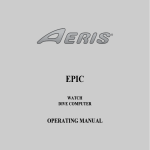 While the Chrono is running, it will remain on the screen until a button operation is performed. If another screen is accessed, it will then continue to run in the background. Upon descending on a dive, Chrono operation will be terminated and reset to 0:00:00.0. When set ON, the Daily Alarm will sound the Audible Alarm at the Time set every day. viewing the Watch Default Time screen will access the Daily Alarm Status screen. > Graphic ON (or OFF), flashing. > Alarm Time Set Point (hr:min) with AM (or PM) icon. will toggle between ON and OFF. every day at the Time displayed. > Graphics AL and SEt with clock (alarm) icon. > Alarm Time previously set (hr:min) with the Hour Set Point flashing. the Set Points in 1 Hour increments at a rate of 8 per second. the Set Points one at a time. and the Minute digits will flash. step upward through the Set Points one at a time. indicated by the graphic ON (or OFF) flashing. to the Watch Default Time screen. The ZEN features 3 Bar Graphs >> NiBG, O2BG, and ASC. etc., to reduce the statistical risk. value other than 'Air' (e.g., a numerical value). allowed for that dive and 24 hour period. speed (i.e., an ascent speedometer). exceed 30 feet per minute (9 meters per minute). information represented to avoid any possible misunderstanding that could result in error. Main screens (Fig. 24b) when applicable. MAX and FT (or M) icons from 0 to 330 FT (99.9 M) in increments of 1 FT (.1 M). real time (e.g., Time of Day, Elapsed Dive Time). Elapsed Dive Time (Fig. 26a/b), the colon is solid (non blinking). FREE Dive Mode displays Times in minute:second format. an Alternate Display while on the surface in Watch mode. entered for Date Format, see page 21. Alternate screens, Date is not displayed. from 2 up to 7 (Fig. 27c). agency to teach diving with Nitrox. • GAUG >> for SCUBA dives with no Nitrogen/Oxygen calculations. will access the NORM, GAUG, or FREE Surface Main screen (whichever was selected). appear as the default display indicated by the graphic Nor (Fig. 28). selected as the Operating Dive Mode. that Mode is selected for the type of dives to be conducted. enter Dive Mode upon descent to 5 FT (1.5 M). series (if Wet Activation is set OFF). the ZEN is operating in at the time of the descent. GAUG dive (Fig. 29A), or 1 minute after a FREE dive (Fig. 29B). releasing the M button momentarily (< 2 sec). can then be accessed by pressing the M button for 2 seconds. NORM SURF ALT screen for 5 seconds. Log Mode, then pressing it again will access History Mode. the Time to Fly screen, then A again the Dsat Time screen. seconds will access the Set Menu. access the FREE Surface Main screen. will revert to the Watch Default Time screen. > Temperature with degrees icon and graphic F (or C). > Time of Day (hr:min) with clock and AM (or PM) icons. sec) will revert to the NORM Surface Main screen. simultaneous 2 second presses of the A and S buttons. must be made using the push buttons. PO2 Alarm limit previously set will be displayed. for Nitrogen calculations (79% Nitrogen) unless the FO2 for Gas 1 is set before the dive. until 24 hours elapse after the last dive, or the FO2 50% Default is turned Off. for the remainder of that series of repetitive dives. The default FO2 for Gas 1 each new dive period is AIR. numerical FO2 value (21 to 50%). the next Nitrox dive (during that dive period and series of repetitive dives). displayed in Set FO2 Gas 1 until a full 24 hour Surface Interval has elapsed. for a higher numerical value. to 50% after the dive. Set Points of Gas 1. FO2 Gas 1 is set for 32%, FO2 Gas 2 can only be set at values from 32 to 100%. Sequence Set F >> FO2 Gas 1 >> FO2 Gas 2 >> FO2 50% Default. is displayed will access the Set F screen (Fig. 32). while SET F is displayed will access Set FO2 Gas 1.
rate of 8 Set Points per second. momentarily at 32% (even if the button is held depressed). through 50%, then stop at Air (or 21%). will step upward through the Set Points one at a time. access Set FO2 Gas 2.
revert to the SET F screen. minutes, operation will revert to the NORM (or GAUG) Surface Main screen. Points in 1% increments, at a rate of 8 per second. 80% (even if the button is held depressed). 100%, then stop at Air (or 21 or the Gas 1 setting). will save the setting and access Set FO2 50% Default. seconds will save the setting and revert to the Set F screen. the NORM (or GAUG) Surface Main screen. > Set Point graphic OFF (or ON), flashing. will toggle between OFF and ON. will save the setting and revert to the Set F screen. Sequence Set A >> Audible >> Depth >> EDT >> NiBG >> DTR >> PO2. is displayed will access the Set A screen (Fig. 36). while SET A is displayed will access Set Audible Alarm. Audible alarm to sound even if this feature is set to OFF. > Set Point graphic ON (or OFF), flashing. will save the setting and access Set Depth Alarm. seconds will save the setting and revert to the Set A screen. Set Point value, flashing, with MAX and FT (or M) icons. increments at a rate of 8 per second until it is released. will save the setting and access Set EDT Alarm. FREE Dive Mode has separate Depth Alarms. > Graphic EDT (meaning Elapsed Dive Time). > Set Point value (hr:min), flashing, with wave/clock icons. will save the setting and access Set NiBG Alarm. FREE Mode has a separate EDT Alarm. > Graphic NBG (meaning Nitrogen Bar Graph). > NiBG Set Point (segments), flashing. Point from all 5 segments (Deco) to 1 one at a time. will save the setting and access Set DTR Alarm. FREE Mode has a separate NiBG Alarm. will save the setting and access Set PO2 Alarm. > Graphics PO2 and AtA. > Set Point value, flashing, with MAX icon. will save the setting and revert to the Set A screen. >> Conservative Factor >> Backlight Duration >> Sample Rate. is displayed, will access the Set U screen (Fig. 43). while Set U is displayed will access Set Wet Activation. > Graphics WET and ACt. > Set Point graphic ON (or OFF) flashing. will save the setting and access Set Units. seconds will save the setting and revert to the Set U screen. revert to the NORM (or GAUG) Surface Main screen. > Set Point icons/graphics F and FT (or C and M), flashing. will toggle between Imperial (F, FT) and Metric (C, M). will save the setting and access Set Deep Stop. > Graphic DS (meaning Deep Stop). > Set Point ON or OFF, flashing, with STOP icon. will toggle the Set Point between OFF and ON. will save the setting and access Set Safety Stop. > Graphic SAF (meaning Safety Stop). will save the setting and access Set Conservative Factor. > Set Point ON or OFF, flashing. will toggle the Set Point between ON and OFF. will save the setting and access Set Backlight Duration. the next higher 3000 foot (915 meter) Altitude. > Graphics BL and dur (meaning Backlight Duration). Set Points of 0, 5, and 10 (seconds). will save the setting and access Set Sampling Rate. > Graphic SR (meaning Sampling Rate). Set Points of 2, 15, 30, and 60 (seconds). will save the setting and revert to the Set U screen. > Factory programmed Serial Number. > Firmware revision number (e.g., graphic r1A). seconds will revert to the Surface Main screen. Records section provided in the back of this Manual. control) following the last dive and surface interval. Surface Main screen is displayed will access the NORM Plan Lead-in screen. > Graphic FO2 with wave/clock/profile icons. Nitrox, blank if set for Air. > Tank 1 icon indicating that FO2 is for Gas (mix) 1. > FO2 Set Point for Gas 1, Air or 21 to 50.
screen and step upward through the sequence of screens. dive profiles in a series of repetitive dives and taking into account descent and ascent rates of 60 FPM (18 MPM). the next 3,000 foot (915 meter) higher Altitude. calculations based on previous dives. > Dive Time (hr:min) allowed for the Depth displayed. and FT (or M) icons and graphic - PO2. > Tank 1 icon indicating Gas (mix) 1. > Plan Depth with FT (or M) icon. the NORM Surface Main screen. after surfacing from a dive from 23:50 to 0:00 (hr:min). first accessing the NORM (or GAUG) Surface Main screen. Surface Main screen, will access Fly Mode. > Countdown Time (hr:min) with clock icon. momentarily (< 2 sec) will access the Desat Time screen. momentarily (< 2 sec) will revert to the GAUG Surface Main screen. period, operation will revert to the NORM (or GAUG) Surface Main screen. minutes after surfacing from a dive, counting down from 23:50 max to 0:00 (hr:min). > The SAT screen is not displayed after a Violation Dive. > Desaturation requiring Times greater than 24 hours will display 23: - - . gained by first accessing the NORM Surface Main screen. will revert to the NORM Surface Main screen. by another dive. Battery removal will not affect the Log data stored for viewing. the Log and the oldest dive's data deleted. Dives will be numbered 1 to 24 starting at #1 each time a new series of dives begins. After it shuts Off 24 hours after a dive, the first dive of the next new series will be #1. > The most recent dive’s Log Preview screen will be displayed. screens at a rate of 8 per second until released. screen will display that dive’s Log Data 1 screen. will display that dive’s Log Data 2 screen (O2 data). > Log screens remain on display until further button action occurs. > Graphic NOR (or GAU). > Dive Mode (wave/clock/profile) icon, if NORM. > Date (month.day or day.month) the dive was conducted. AM (or PM) icon if set for 12 Hour Format. > # icon and dive number (1 to 24) for that series. will access that dive's Log Data 1 screen. will bypass Log Mode and access the History Mode. of dive accumulation. All flashing if Violation. 59 minutes, ( - : - - ) if no previous dive that period. icon and graphic F (or C). > Elapsed Dive Time (hr:min) with wave/clock icon. > Max Depth with MAX and FT (or M) icons. > ASC representing max Ascent Rate recorded for 4 seconds. • Pressing and releasing the S button momentarily (< 2 sec) will access Log Data 2. (or GAUG) Surface Main screen. > Graphic FO2 (at top) and FO2 Set for Gas 1 for that dive (at bottom). > O2BG segments representing O2 accumulated at the end of the dive. > Max PO2 achieved (ATA) with MAX icon and graphic PO2. > Tank 1 icon representing Gas (mix) 1.
access the previous dive's Log Preview screen. NORM (or GAUG) Surface Main screen. removal will not affect the History data stored for viewing. > Total number of all dives recorded up to 999 with # icon. will access the History 2 screen. > Altitude graphic SEA (or EL 2 through EL 7), max level. > Max EDT (hr:min) for a single dive with wave/clock icon. > Max Depth ever recorded with MAX and FT (or M) icons. NOTE: FREE Dives are not recorded in the viewable Log or History. training will place you in an unnecessarily dangerous situation. and virtually non-existent for repetitive decompression diving. The ZEN constantly monitors No Decompression status. calculated based on the amount of Nitrogen absorbed by hypothetical tissue compartments. as NDC (Fig. 61a) and the NiBG (Fig. 61b). will recede as control shifts to slower compartments. If FO2 was set for a numerical value (Nitrox), the O2BG (Fig. that dive, or 24 hour period, whichever amount is greater. O2 will replace NDC. High O2 is described later. (see chart on page 33), all segments of the ASC will flash (Fig. change at a reference depth of 60 FT (18 M). Rates should not exceed 30 FPM (9 MPM). the NORM No Decompression Dive Mode any time you descend to 5 FT (1.5 M) for 5 seconds. such as Surface Mode, Plan, Fly, etc. • Press/release the A button (< 2 sec) to view ALT 1. • Press the L button to activate the Backlight. • Press/release the A button to access ALT 2.
if the A button is pressed/released. the time when an Alarm is sounding. you ascend above the Stop Depth. and ascent (or other activity) is continued. with wave/clock/profile mode icon, Tank icon (Gas 1 or 2), current Depth with FT (or M) icon, and applicable bar graphs. view ALT 3 that displays FO2 and PO2 (Fig. 69C). O2 (80%), or descend deeper than 190 FT (63 M). During High PO2 (=> Alarm Set Point), the DS screen information will be replaced with High PO2 information. displaying a recommended Stop at 15 FT (4.5 M) with a Countdown Timer that counts down from 03:00 to 0:00 (min:sec). you surface during the countdown. • There is no Preview screen associated with the Safety Stop. (or M) icon, and applicable bar graphs. NiBG will flash to alert you. (3 M) below the Stop Depth indicated, then it will be blank. • Depress the L button to activate the Backlight. for all deco stops plus vertical ascent time to the surface. are disabled for the remainder of that dive, even when the Deco obligation is complete and No Deco status is regained. slightly less credit given the deeper you are below the Stop Depth indicated. given, until you descend below the Ceiling Depth. elapsed, operation will continue to function in Deco and off gassing credit will resume. be acknowledged (silenced) by pressing the S button. NiBG will flash until you descend below the required Stop Depth. This is a continuation of a Conditional Violation. (Total Ascent Time) digits will flash. those Stop Depths and continue decompressing. dashes ( - - - ). Log for that dive will display 3 dashes as the Max Depth achieved. which a Delayed Violation (1, 2, or 3) occurred. Plan, Fly, and Dsat features/screens. interval must then be served before all functions are restored. > The value of PO2 can be viewed on the ALT 2 screen. • Press/release the A button to view the ALT screens. ALT screen) will increase in increments of .01 (ATA). decreases 0.2 (ATA) below the alarm Set Point. you are coming to the limits of oxygen exposure. Arrow icon will be displayed flashing (Fig. 80B). The Audible Alarm will sound. When the audible is acknowledged/silenced, the O2 graphic becomes solid until O2 decreases below 100%. O2BG recedes to 4 segments. Access to Watch Mode is allowed but access to GAUG and FREE is blocked. barometric pressure if activated by immersion in water at higher Altitudes. throughout your dives to reduce your risk of exposure to decompression sickness, oxygen toxicity, and the effects of excessive ascent rates. During NORM Dives, the FO2 calculations/displays can be switched from Gas 1 to 2. > Switching Gas cannot be performed while on the surface. dive, operation defaults to the Gas 1 FO2. time that an Alarm is sounding. (Fig. 81) until the Audible is silenced. prohibitive Mix is still allowed. decreases below 1.60, then TAT will be restored. time that a Gas Switch Preview screen is being displayed. Preview screen to Switch FO2 to that Gas. seconds of no further M button action. the surface (if less than 10 minutes) will not be added as Dive Time. are accessible after 10 minutes on the surface. Preview screen for that dive. • Depress the A button for 2 seconds to access SURF ALT. remaining from the previous dives. A USB Driver is provided on the PC Interface CD, also available as an accessory. Points, NiBG, O2BG, and Gas Switching events. are then initiated using the PC program. that you consider appropriate for your Interface activities. When Digital Gauge Mode (GAUG) is selected as the operating mode, the ZEN will operate as a Digital Depth Gauge/Timer without performing nitrogen and oxygen calculations. displayed, press the M button 1 time for 2 seconds. GAU becomes solid and Gauge Mode is selected. advance to the Free Surface Main screen. access Log, then again to access History. screen (Fig. 88 - Altitude, Temperature, Time of Day). to access the Set menu (F >> A >> U). access the Time to Fly screen, if a dive was conducted. Mode or FREE Dive Mode. or if the A button is pressed. referred to as Delayed Violation 3 will be activated. remaining during 24 hours is carried over between FREE and NORM operating modes. screen (no Gauge dive was made), press the M button 1 time for 2 seconds. • The graphic FRE will flash indicating that it can be selected as the operating mode. becomes solid and Free mode is selected for the dives to be conducted. access the Watch Default Time screen. access the Free Surface ALT 1 screen, then again ALT 2. (Count Down Timer) Status screen. Set Free Depth Alarms 1, 2, 3.
access the Free Surface ALT 2 screen. Main screen, the CDT can be started, stopped, and set. and 0:00 if no time was previously set. and OFF. A toggle to ON will Start the CDT if a Time has been set. minutes, operation will revert to the Free Surface Main screen. During a dive, the CDT can be turned OFF (stopped) and ON (started), but not Set. to the Free Surface Main screen. and Time digits will flash every 30 seconds (Fig. 98). can not be changed during a Dive. > Set Point OFF (or ON) flashing. setting and access Set Free Depth Alarm 1.
at progressively deeper Depths and turned OFF/ON. > If Alarm 1 is set OFF, then Alarms 2 and 3 will be disabled. > If Alarm 2 is set OFF, Alarm 3 will be disabled. Depth digits will flash (Fig. 100). DA1 (Depth Alarm 1) screen. DA2 and DA3 similar. per second until it is released. access ALT 1 (Free CDT Status). • Press the L button will activate the Backlight. solid, indicating that it is set and ready to Start. toggle the CDT ON/OFF (Start/Stop). operation will revert to the Main. display to identify an event. in place of NDC Time. modes are separate and unaffected by Free Dive alarms. will sound 3 times during which the graphic CDT will flash (Fig. 106), then NDC will be restored. flash (Fig. 107), then NDC will be restored. reaches the DA 2 and DA 3 Set Points, if set ON. when it is set ON prior to the dive. conducted within 24 hours is displayed as the NiBG. Up Arrow icon will be removed. operation will enter Violation Gauge Mode for 24 hours. NiBG and full O2BG will be displayed with all segments flashing, and the graphic VIO will be displayed flashing (Fig. 110). 10 minutes the NiBG and O2BG will be removed. NORM or GAUG will be blocked. which permits the user to maintain awareness of nitrogen absorption and off gassing status. associated with the high pressures that competitive type Free diving can expose a diver to. FREE) prior to commencing any dive. decompression which could cause serious injury or death. recommended. Presently, there is no data relating to such activities. be understood and the diver is physically prepared. Protect your ZEN from shock, excessive temperatures, exposure to chemicals, and tampering. Protect the lens against scratches with an instrument lens protector. Interface Data Port (Fig. 111b), and Buttons are free of debris or obstructions. running fresh water and towel dry before storing. • Transport your ZEN system cool, dry, and protected. inspection. To keep the product warranty in effect, this inspection must be completed one year after purchase (+/- 30 days). Take your ZEN to an Authorized TUSA Dealer. NOTE: The procedures that follow must be closely adhered to. Damage due to improper Battery replacement is not covered by the product's warranty. extreme care taken to prevent the entrance of moisture or dust. air conditioned environment then take it outside during a hot sunny day). GAUG, or FREE) until it receives proper factory service by TUSA. for repetitive dives will be retained in non volatile memory for subsequent operations. CAUTION: Damage due to improper Battery replacement is not covered by the product's warranty. • Locate the Battery Compartment on the back of the unit. upper portion to the right using your fingers (Fig. 112B). • Lift the Hatch with O-ring up and away from the Housing. governing disposal of Lithium batteries. to the negative ( - ) contact of the Battery Compartment. damage that might impair proper sealing. recommended each time a Battery is replaced. signs of damage that might prevent proper sealing. and DO NOT attempt to use it until it has received factory prescribed service. the contact clip on the lower/right rim of the cavity. that it is evenly seated (Fig. 115). and completely down into place. counter clockwise 10 degrees using the Hatch tool (Fig. pushing the upper portion to the left using your fingers (Fig. and sharp in contrast throughout the screen. • Set the Watch functions. • Verify all Set Points prior to diving. operation reverts to Watch mode after 2 hours. minutes during the 24 hour period after surfacing. > Measurements are only taken when the unit is dry. The Mathematical Model in the ZEN accounts for the reduced No Deco Dive Times available based on National Oceanic and Atmospheric Administration (NOAA) guidelines. No adjustments are made during any time that the Wet Contacts are wet. feet of seawater to feet of fresh water. This is the first adjustment to the Algorithm. calculations are based upon an Altitude of 6,000 feet. The ZEN will not function as a Dive Computer above 14,000 feet (4,270 meters). Arrow icon and current Depth. dive and begin a safe controlled ascent to the surface. No dive computer functions (modes/screens) will be accessible. If this occurs, the ZEN must be returned to the factory for evaluation/service prior to any further use for diving activities. 15 minutes while in NORM/GAUG/FREE Surface Modes. • Reduces NORM/FREE NDLs to those for the Altitude 3,000 feet (915 meters) higher. • Manual - push button (recommended), required if Wet Activation is set OFF. • Reverts to Watch Default Time if no dive is made within 2 hours after entry into a Surface Mode. • Reverts to Watch Default Time 10 minutes after dive. • Out of the water - between 20 °F and 140 °F (-6 and 60 °C). • In the water - between 28 °F and 95 °F (-2 and 35 °C). • Out of the water (in storage case provided) - between 14 °F and 158 °F (-8 and 70 °C). will help you avoid a low air or decompression situation. • Do not plan any dive that exceeds your training or experience level. abnormal function, DO NOT dive with it until it has received factory prescribed service. Nitrogen Bar Graph inside the normal No Decompression zone. your ascent until the Nitrogen Bar Graph is at least inside the No Decompression Caution Zone. you can establish and adjust your personal level of conservatism and margin of safety.